Background: Virtually many patients with spinal cord injury (SCI) suffer from neurogenic lower urinary tract dysfunction (NLUTD). Although the most severe consequence of NLUTD, damage of renal function, can be treated effectively today, urinary tract infections (UTI) are the most common urologic problems in SCI patients. They severely impair the quality of life, and no evidence-based prophylaxis exists. The goal of this study is to assess the usefulness of adjunctive homeopathic treatment for the reduction of UTI in patients with SCI. 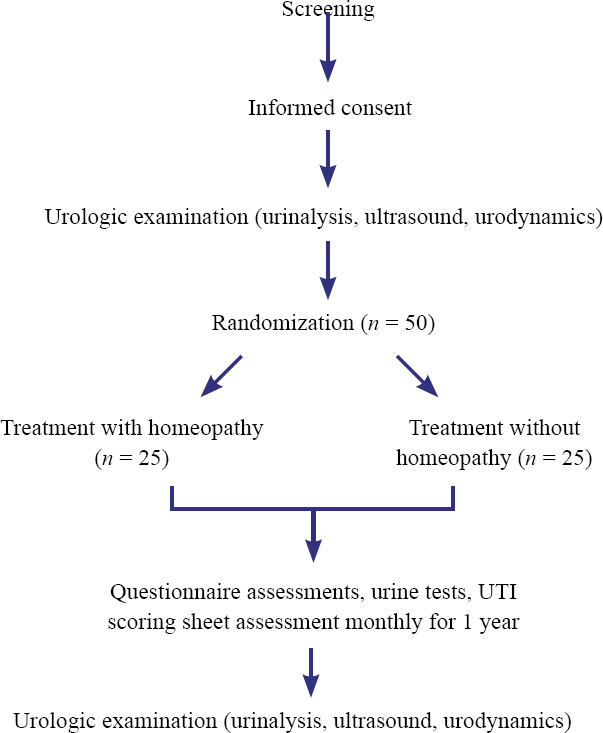 Methods/Design: A prospective randomized controlled trial is designed to assess whether adjunctive treatment with classical homeopathy leads to a relevant reduction of the rate of UTI in patients with SCI. In addition, it will be assessed if homeopathic treatment will significantly improve patient satisfaction and quality of life. Fifty patients with SCI and recurrent (3 or more) UTI per year will be recruited from the patients of the neuro-urology of the Swiss paraplegic Centre in Nottwil, Switzerland. All patients will be randomly allocated into two groups: patients in the homeopathy group (n = 25) will receive standard of-care prophylaxis combined with homeopathic treatment; the control group (n = 25) will receive standard of-care prophylaxis alone. Standard of-care prophylaxis consists of cranberry products and urine acidification. Homeopathic treatment consists of a homeopathic medication; the remedy is chosen individually based on the homeopathic case taking. Patients do not routinely present to the homeopaths during the study, but can contact them if a UTI occurs during the course of the study. Primary outcome are the UTI rate, and secondary outcomes are quality of life and satisfaction with the treatment over a follow-up period of 1 year. Discussion: There is a high demand for effective UTI prophylaxis in patients with SCI, because UTI are associated with an increased morbidity and even mortality. The results of the study will significantly add to our knowledge not only about UTI prevention, but the clinical value of homeopathy. Trial registration: ClinicalTrials.gov identifier: NCT01477502, registered on 17 November 2011. Ethics: The "Ethikkommission Nordwest- und Zentralschweiz (EKNZ): PB_2016-00054" approved this study protocol. In the clinic, almost all patients with spinal cord injury (SCI) suffer from a neurogenic lower urinary tract dysfunction (NLUTD). The most severe consequence of NLUTD is renal dysfunction, which is the most common cause of death in this group of patients if untreated (Hackler, 1977). Standard treatment is the suppression of neurogenic detrusor overactivity (NDO), e.g., by antimuscarinic drugs, bladder evacuation, and intermittent catheterization (Groen et al., 2016). Since the risk for renal damage could be substantially decreased by adequate urologic diagnostics and treatment (Groen et al., 2016), urologic care of SCI patients focuses on other urologic consequences of SCI, e.g., UTI. Symptomatic urinary tract infections (UTI) are one of the major and most common urologic problems in SCI patients. UTI occur in approximately 60% of the SCI patients after discharge from primary rehabilitation (Unsal-Delialioglu et al., 2010). They are the most common cause of septicemia and are associated with a significantly increased mortality (Biering-Sorensen et al., 1999; Esclarin De Ruz et al., 2000). In addition, they drastically impair the quality of life of the affected patients (Pannek, 2011). The guidelines of the urologic and paraplegiologic associations agree that only symptomatic UTI should be treated (Everaert el al., 2009; Groen et al., 2016). Unfortunately, UTI recur frequently in SCI patients, and the bacteria are getting more resistive to antibiotics (Hinkel et al., 2004). If no morphologic or functional changes for recurrent UTI can be detected, UTI prophylaxis relies on medical treatment. Low-dose long-term antibiotics used frequently for the treatment of UTI have been demonstrated not to be effective, but to increase the risk of multi-resistive bacterial strains (Naber et al., 2001; Morton et al., 2002; Garcia Leoni and Esclarin De Ruz, 2003). As an alternative, a weekly oral cyclic antibiotic (WOCA) program is discussed, and initial results are promising, but data are sparse (Salomon et al., 2006). The most popular non-antibiotic alternative is cranberry products for the treatment of UTI, but their usefulness in SCI patients has not been proven (Lee et al., 2007; Hess et al., 2008). No evidence regarding the efficacy of other plant extracts and bladder irrigation for urine acidification after SCI exists (Trautner and Darouiche, 2002; Pannek, 2012). A small study gave a hint that oral immunotherapy with E.coli extracts may be effective in NLUTD patients following SCI (Hachen, 1990). Recurrent UTI severely impairs the quality of life in the affected patients, but prophylaxis remains a try-and-error approach, because no evidence-based prophylaxis exists. Based on clinical experience, cranberries, urine acidification, long-term antibiotics and oral immunotherapy are the most frequently applied measures and are therefore regarded as the current standard (Pannek, 2012). Homeopathy is a medical treatment with potentized drugs, which are chosen based on the law of similarity due to the individual signs and symptoms of the patient. Homeopathy relies on the concept of "vital force". Disturbance of the vital force leads to symptoms. The appropriate remedy is found through analysis of the individual symptoms of the affected patients. Thus, the choice of the remedy is based on the patient's complaints but not on a clinical diagnosis. Therefore, a specific remedy for diagnosis of UTI does not exist. The efficacy of homeopathy in treating UTI is well documented in several case series (Sparenborg-Nolte and Nolte, 2008; Pannek, 2014). However, no prospective study evaluating the use of homeopathy for prophylaxis of UTI in SCI patients has been performed. The objective of this study is to test the hypothesis that an adjunctive treatment with classical homeopathy (Hahnemann, 2005) leads to a reduction in the rate of recurrent UTI in SCI patients and to assess if homeopathic treatment will significantly improve patient's satisfaction and quality of life. Group 1 (n = 25): Patients receiving standard care for prophylaxis (cranberries, urine acidification, long-term antibiotics and oral immunotherapy). Group 2 (n = 25): Patients receiving standard care for prophylaxis as described above plus adjunctive classical homeopathy (Hahnemann, 2005). This project is approved by Ethikkommission Nordwest- und Zentralschweiz (EKNZ): PB_2016-00054XXX. The design is described in [Figure 1]. All consecutive SCI patients with NLUTD who present at the outpatient service of the neuro-urology of the Swiss Paraplegic Centre, are asked, as part of the medical history, about the number of UTI they suffered from in the past one year. All patients who reported at least 3 UTI/year were offered to be screened for the study. For inclusion and exclusion criteria, see [Table 1]. Based on clinical experience and on our own data (Krebs et al., 2016), we assumed a UTI rate of 5 UTI/year and a reduction of the UTI rate of 25%. For equal allocation of the two groups, the total sample size required when considering a dropout rate of 10% is 50 participants. Given a standard deviation of 30%, 25 participants per group are needed (power = 80%, level of significance α = 0.05). Power analysis was done with R software environment (version 3.1.0, Copyright 2014, The R Foundation for Statistical Computing). Bsaseline evaluation consisted of a detailed and standardized medical interview, including the method of bladder evacuation, the drugs used, and the number of UTI within the last year. To assess the state of the upper and lower urinary tract, a video-urodynamic test, and ultrasound of the bladder and the kidneys was performed. Urinalysis and serum cystatin C for renal function were assessed. Participants will be randomly allocated to either the group 1 or group 2 after the baseline assessment. The randomization is performed according to computer generated random allocation treatment codes. The randomization list is kept by an independent investigator not involving in the care or assessment of the participants, or in the data collection and analysis. Randomization was performed with the SPSS software (version 18.0.3, IBM, Somers, NY, USA). Patients receiving adjunctive homeopathic treatment will be treated by an experienced certified homeopath from the "SHI homeopathic centre" in Zug, Switzerland. All participants will be educated about the possible signs and symptoms of a UTI. They receive a standardized document listing the typical symptoms of UTI in patients with SCI, which is based on the current definition of the ISCoS (International Spinal Cord Society) (Goetz et al., 2013). Whenever symptoms occur, participants fill out a documentation sheet and test the urine with a dipstick test (leucocytes and nitrite). Acute UTI that occur during the study period are treated as usual. After a follow-up period of 1 year, with the monthly application of the urine tests and questionnaires listed below, a final evaluation and close-out visit will be performed. At that visit, the baseline examinations will be repeated, and the questionnaires mentioned below will be filled in. Primary outcome measure is the number of UTI per year. The number of UTI within the year before the study was assessed by medical history alone. The number of UTI during the study period was assessed by medical history (interview after 12 months) and, in addition, the UTI occurring during the study period are documented with the documentation sheet mentioned above. The sheets are collected by the patients and monthly sent to our center. If no UTI occur during a month, a documentation sheet stating this fact will be returned. Secondary outcome measures are the satisfaction with the homeopathic treatment and the quality of life. Standardized, validated questionnaires are used to assess patients' satisfaction with the treatment (MYMOP [Measure yourself medical outcome profile] questionnaire (Paterson and Britten, 2000)), urology-specific quality of life (King's Health Questionnaire (Bjelic-Radisic et al., 2005)), and general quality of life (EuroQol EQ 5D (Rabin and de Charro, 2001) and "Satisfaction with life scale (SWL)" (Diener et al., 1985)). The MYMOP, EQ5D, and SWL are filled in monthly, the King' s Health Questionnaire at the beginning and at the end of the study. In addition, patients reported their attitude towards homeopathy at the beginning and at the end of the study, using a standardized questionnaire (Pannek-Rademacher, 2011) ([Table 2]). The inter-group difference regarding the number of patients with UTI during the observation period will be analyzed by a chi-square test based on a 2  2 contingency table. The intergroup difference of the UTI rate within the observation period, group-specific patient satisfaction with homeopathy and the quality of life will be tested using the Mann-Whitney U test for non-parametrical data. The changes in patients satisfaction and quality of life over the study period (comparison before-afterwards) will be analyzed using the Wilcoxon test. Recurrent UTI remain to be one of the most common problems in patients with NLUTD due to SCI. Despite multiple efforts, solid data about the efficacy and safety of prophylactic measures in this patient cohort are scarce. A plethora of different treatments are currently in use (Pannek, 2012), although no evidence-based proof of efficacy exists, and some of those are even associated with adverse long-term effects. As UTI are associated with significant mortality and an impaired quality of life (Biering-Sorensen et al., 1999; Pannek, 2011), the detection of an effective UTI prophylaxis for SCI patients would be of high relevance for the affected persons, leading to a significant improvement of their quality of life and reduction of morbidity. Homeopathy has been demonstrated to be without serious long-term risks, there is a high demand by the patients (Pannek et al., 2015), and its possible usefulness has been demonstrated in case studies (Pannek et al., 2014). Homeopathy is not associated with significant side effects; therefore the drugs used in this study are safe for the participants. The results of the study will significantly add to our knowledge not only about UTI prevention, but the clinical value of homeopathy. As the number of persons with SCI living in Switzerland is comparatively small when compared to other diseases, the number of possible participants is limited. If homeopathy was an effective prophylaxis in SCI patients, suffering by definition from complicated UTI, it may also have a positive effect in persons with uncomplicated recurring UTI, which is a far larger group of patients. Thus, the results from our study may foster further research on recurrent UTI in other patient cohorts. Biering-Sorensen F, Nielans HM, Dorflinger T, Sorensen B (1999) Urological situation five years after spinal cord injury. Scand J Urol Nephrol 33:157-161. Bjelic-Radisic V, Dorfer M, Tamussino K, Greimel E (2005) Psychometric properties and validation of the German-language King′s Health Questionnaire in women with stress urinary incontinence. Neurourol Urodyn 24:63-68. Diener E, Emmons RA, Larsen RJ, Griffin S (1985) The Satisfaction With Life Scale. J Pers Assess 49:71-75. Esclarin De Ruz A, Garcia Leoni E, Herruzo Cabrera R (2000) Epidemiology and risk factors for urinary tract infection in patients with spinal cord injury. J Urol 164:1285-1289. Everaert K, Lumen N, Kerckhaert W, Willaert P, van Driel M (2009) Urinary tract infections in spinal cord injury: prevention and treatment guidelines. Acta Clin Belg 64:335-340. Garcia Leoni ME, Esclarin De Ruz A (2003) Management of urinary tract infection in patients with spinal cord injuries. Clin Microbiol Infect 9:780-785. Goetz LL, Cardenas DD, Kennelly M, Bonne Lee BS, Linsenmeyer T, Moser C, Pannek J, Wyndaele JJ, Biering-Sorensen F (2013) International Spinal Cord Injury Urinary Tract Infection Basic Data Set. Spinal Cord 51:700-704. Groen J, Pannek J, Castro Diaz D, Del Popolo G, Gross T, Hamid R, Karsenty G, Kessler TM, Schneider M, ′t Hoen L, Blok B (2016) Summary of European Association of Urology (EAU) Guidelines on Neuro-Urology. Eur Urol 69:324-333. Hachen HJ (1990) Oral immunotherapy in paraplegic patients with chronic urinary tract infections: a double-blind, placebo-controlled trial. J Urol 143:759-762. Hackler RH (1977) A 25-year prospective mortality study in the spinal cord injured patient: comparison with the long-term living paraplegic. J Urol 117:486-488. Hahnemann S (2005) Organon der Heilkunst, 6. Auflage. Marix, Wiesbaden. Hess MJ, Hess PE, Sullivan MR, Nee M, Yalla SV (2008) Evaluation of cranberry tablets for the prevention of urinary tract infections in spinal cord injured patients with neurogenic bladder. Spinal Cord 46:622-626. Hinkel A, Finke W, Bötel U, Gatermann SG, Pannek J (2004) Increasing resistance against antibiotics in bacteria isolated from the lower urinary tract of an outpatient population of spinal cord injury patients. Urol Int 73:143-148. Lee BB, Haran MJ, Hunt LM, Simpson JM, Marial O, Rutkowski SB, Middleton JW, Kotsiou G, Tudehope M, Cameron ID (2007) Spinal-injured neuropathic bladder antisepsis (SINBA) trial. Spinal Cord 45:542-550. Morton SC, Shekelle PG, Adams JL, Bennett C, Dobkin BH, Montgomerie J, Vickrey BG (2002) Antimicrobial prophylaxis for urinary tract infection in persons with spinal cord dysfunction. Arch Phys Med Rehabil 83:129-138. 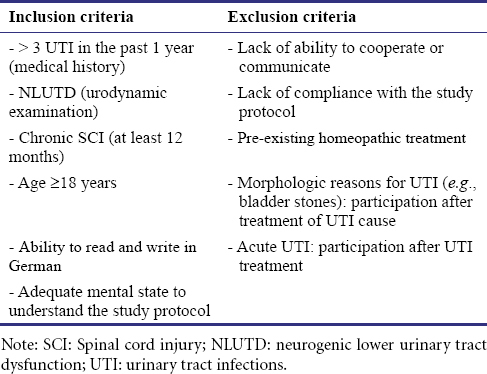 Naber KG, Bergman B, Bishop MC, Bjerklund-Johansen TE, Botto H, Lobel B, Jinenez Cruz F, Selvaggi FP; Urinary Tract Infection (UTI) Working Group of the Health Care Office (HCO) of the European Association of Urology (EAU) (2001) EAU guidelines for the management of urinary and male genital tract infections. Urinary Tract Infection (UTI) Working Group of the Health Care Office (HCO) of the European Association of Urology (EAU). Eur Urol 40:576-588. Pannek J (2011) Treatment of urinary tract infection in persons with spinal cord injury - guidelines, evidence and clinical practice J Spinal Cord Med 34:11-15. Pannek J (2012) Prophylaxis of urinary tract infections in subjects with spinal cord injury and bladder function disorders - current clinical practice. Aktuelle Urol 43:55-58. Pannek J, Pannek-Rademacher S, Jus MC, Jus MS (2014) Usefulness of classical homoeopathy for the prevention of urinary tract infections in patients with neurogenic bladder dysfunction: A case series. Indian J Res Homoeopathy 8:31-36. Pannek J, Pannek-Rademacher S, Wöllner J (2015) Use of complementary and alternative medicine in persons with spinal cord injury in Switzerland: a survey study. Spinal Cord 53:569-572. Pannek-Rademacher S (2011) Sind Globuli und Intensivmedizin kompatibel? intensiv 19:232-235. Paterson C, Britten N (2000) In pursuit of patient-centred outcomes: a qualitative evaluation of the ′Measure Yourself Medical Outcome Profile′. J Health Serv Res Policy 5:27-36. Salomon J, Denys P, Merle C, Chartier-Kastler E, Perronne C, Gaillard JL, Bernard L (2006) Prevention of urinary tract infection in spinal cord-injured patients: safety and efficacy of a weekly oral cyclic antibiotic (WOCA) programme with a 2 year follow-up--an observational prospective study. J Antimicrob Chemother 57:784-788. Sparenborg-Nolte A, Nolte S (2008) Homöopathie und Naturheilverfahren - eine sinnvolle Kombination am Beispiel des akuten Harnwegsinfektes. AHZ 253:224-228. Trautner BW, Darouiche RO (2002) Prevention of urinary tract infection in patients with spinal cord injury. J Spinal Cord Med 25:277-283. Unsal-Delialioglu S, Kaya K, Sahin-Onat S, Kulakli F, Culha C, Ozel S (2010) Fever during rehabilitation in patients with traumatic spinal cord injury: analysis of 392 cases from a national rehabilitation hospital in Turkey. J Spinal Cord Med 33:243-248. JP, SPR, MSJ, and JK conceived and designed the study, acquired data, and drafted the manuscript. MSJ made substantial contributions and revisions to the manuscript. All authors read and approved the final manuscript. Peer review This paper was double-blinded and stringently reviewed by international expert reviewers.